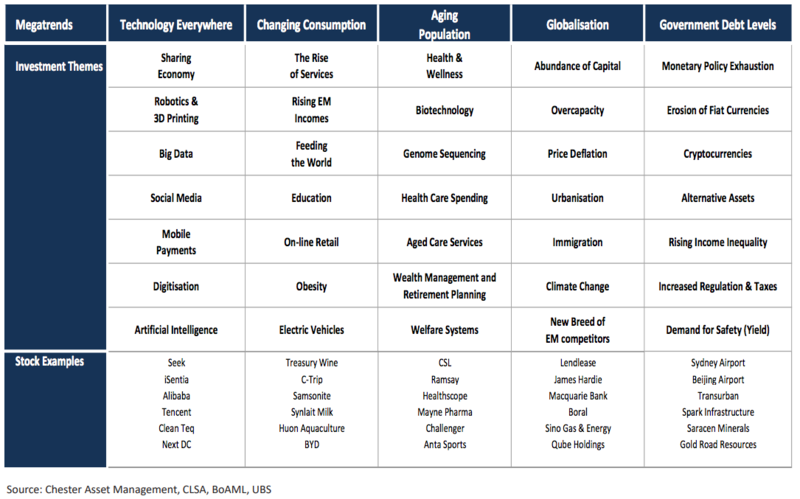 We have used the megatrends framework as a template for several years, simply as a way of formulating a framework for how we start filtering down the investible universe into stocks that we ultimately focus on. We revisit this every 6-12 months to assess where the opportunities are to find companies that have the ability to grow in spite of the challenging macro backdrop. These are often referred to as investing “tailwinds”. Of course, there is a large amount of overlap between different megatrends, particularly when assessing the population growth of the world and the ageing population thematic, and then assessing technological changes and how that affects globalisation and consumption habits. What we are ultimately trying to do is identify a subset of stocks that have “tailwinds” behind them. We define tailwinds as stronger than GDP growth rates over the foreseeable future. This is not always easy when every asset class is faced with the amount of government and central bank intervention as has been the case over the past 7 years. It has certainly changed the way markets operate, all of which is out of our control. We can control, however, the individual investments we allocate capital to in our portfolio. Whilst far from perfect, this is one of our frameworks we use to identify our watchlist. Our watchlist is a subset of the ASX300 and select Asian consumer names that we then spend more time understanding in greater depth. Our watchlist ends up being around 80-90 stocks (roughly 70-75 Australian names and 10-15 Asian names). Then, to how we narrow the focus on sectors, let’s use an example. i.e. feeding the world appears to be a structural trend that will play out over a number of years, particularly as Asian incomes rise, and the demand for dairy products and proteins (salmon and beef) only increases. The obvious sector to focus on is agriculture, which extends from wine, dairy products, beef, cereal producers to fertilisers and crop protection. Using ASX codes to illustrate the universe here; TWE, HUO, TGR, AAC, A2M, BAL, BGA, SM1 and NUF all provide exposure to this theme. The corporate governance risk (board structure, remuneration policy, OH&S issues or reputational risk). This is how we evaluate each company. Combining this assessment with our internal valuation then suggests which (if any) of the stocks we would like to own. In this scenario, it is very much a competition for capital between stocks that offer a compelling risk reward outcome, combined with any particular insights we may have that gives rise to the highest conviction ideas. Other trends aren’t as easy to access from the ASX universe. For example, mobile payments, big data and social media. There are very few ways to gain exposure to this thematic in Australia. XRO, NXT and ISD are probably the three stocks that provide this exposure. Changing consumption patterns, particularly in Emerging Markets, is a thematic that will identify interesting investment opportunities for a long time to come. Great article to generate ideas, thanks.